Ultimate Artists is an Artist Development Programme with a passion for nurturing talent, cultivating artistry and fostering self-belief. 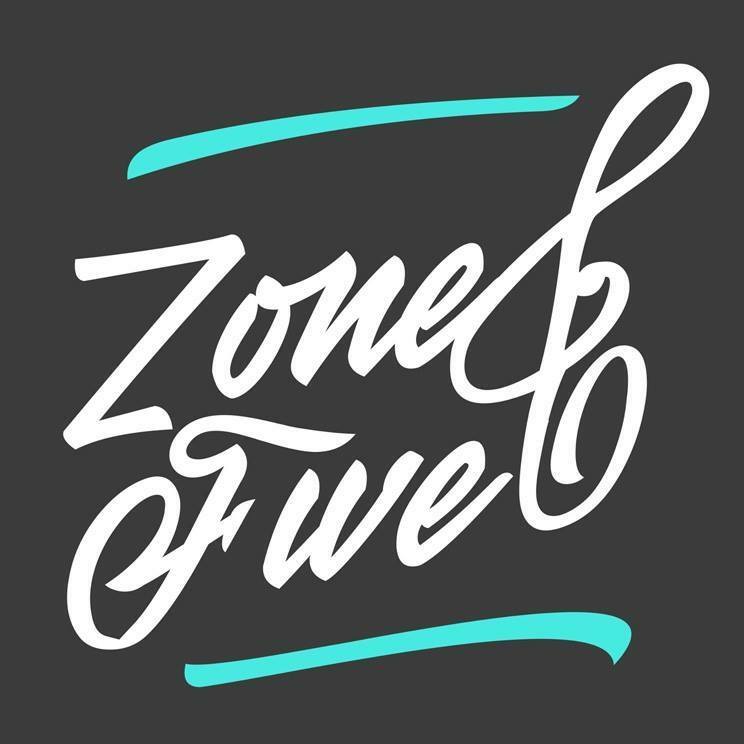 This ten day experience (running from the 9th to the 18th of August 2019) will provide aspiring artists with an unrivaled platform to learn, network and develop a 360 degree skill set in the key disciplines of artist development, as required by today's ever-changing and competitive Music Industry. Working alongside some of leading mentors in the Industry, whose current clients include Rita Ora, Rihanna, Sia, Little Mix, Louisa Johnson, JP Cooper, Dyo, Fleur East, Will.I.Am and David Guetta, Ultimate Artists will coach you in the areas of Singing, Song Writing, Production and Performance. Have you ever thought about developing your vocal talents into a singing career? Well, now you can!!! Teaming up with accomplished pianist, composer and leader of one of Malta's most sought-after Wedding and Entertainment Bands Heathcliffe Balzan, our Green Room Sessions are BACK!!! The key to a successful performance from any singer is a good musical foundation and this month Heathcliffe is going to deliver just that! Delving into the world of tempo and timing, Heathcliffe, alongside our trusty house band, is going to teach singers how to get the most out of their performance with some simple tips on how to feel and hear the beat, thereby creating more unity between themselves and their accompaniment! If you are looking to improve your confidence and performance skills, connect a little more with the band and your target audience, enjoy and explore repertoire you wouldn’t normally consider, make a song your own and delve into the in's and outs of life as a corporate singer, then this event is for you! 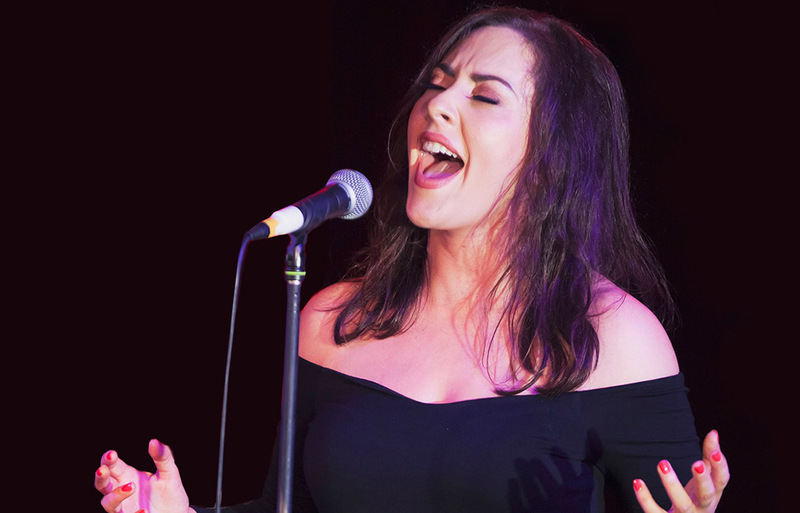 Providing a rich, supportive and nurturing platform for singers to develop their performance skills, our Green Room Sessions performance workshop will be taking place on Friday the 29th of March at 8.30pm in The Porter House in Oranmore! As part of the workshop, each participant will be pre-allocated a song and invited to deliver that song live on stage from 9.30pm, in front of a relaxed and intimate audience of family and friends! Book now to be part of this incredible experience and learn some valuable performance skills!!! Our band is waiting for YOU!! Please note that places are limited for this event! If you are looking to improve your confidence and performance skills, connect a little more with your target audience, enjoy and explore repertoire you wouldn’t normally consider and delve into the in's and outs of life as a corporate singer, then this event is for you! 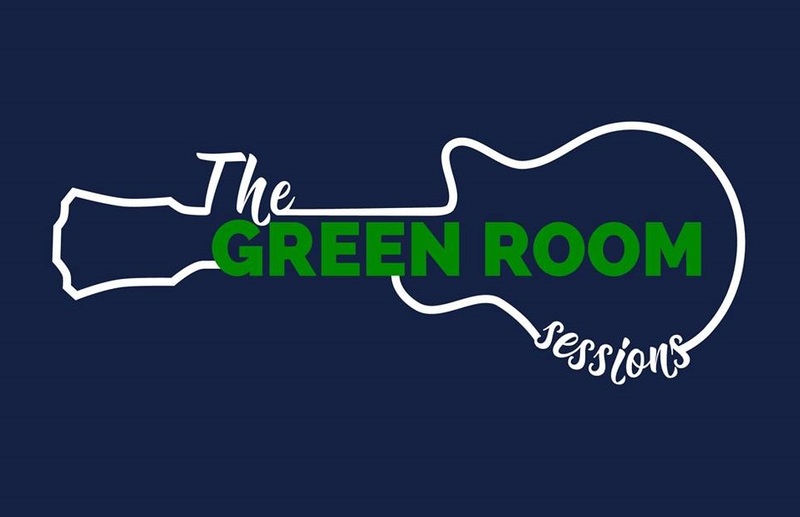 Providing a rich, supportive and nurturing platform for singers to develop their performance skills, our Green Room Sessions will be taking place on Friday the 25th of January at 9.30pm in The Porter House in Oranmore! As part of the event, each participant will be pre-allocated a song and invited to deliver that song live on stage, in front of a relaxed and intimate audience of family and friends! Why not dive outside your comfort zone this January and be part of this incredible experience! 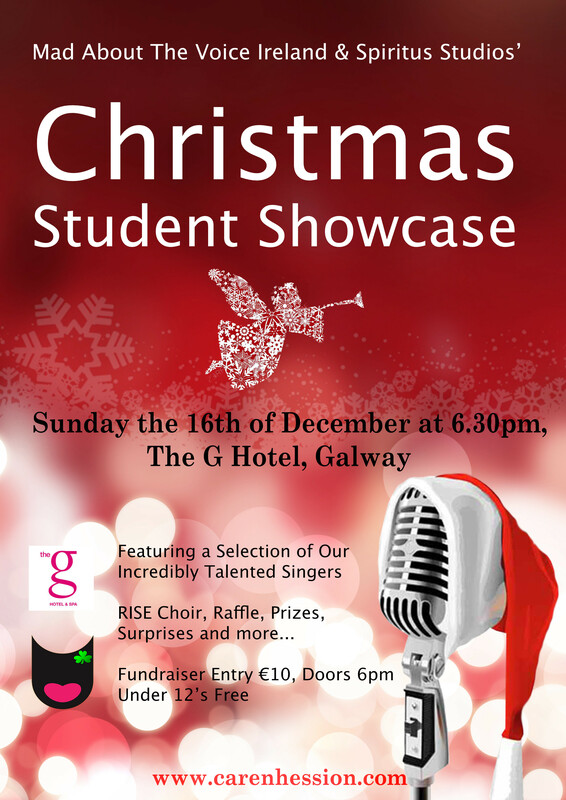 Our Christmas Student Showcase will be taking place on Sunday the 16th of December at 6.30pm (Sharp) in the elegent G Suite of The G Hotel - a luxurious 5 star hotel located at the entrance of Galway City. Here, our singers will be backed by a FULL LIVE HOUSE BAND, delivering a spectacluar show to inspire and enlighten you!! This professional event provides an important platform for their artistic growth and a memorable evening for family and friends to witness a milestone in their journey! With raffle, prizes, surprises and more, this is one event not to be missed!!!! Doors opening at 6pm! Show starts at 6.30pm sharp! Hold onto your hats!!! Joshua Alamu is back!!!! And this time he is delivering an absolutely insane LIVE BAND PERFORMANCE WORKSHOP!! London's most sought after Industry Vocal Coach Joshua Alamu (currently vocal coach to Rita Ora, JP Cooper, Little Mix, Emmi, Fleur East, Louisa Johnson, Moss Kena, Raye and many more) will be coaching singers on the more performative aspects of singing and self-expression with his HUGELY SUCCESSFUL and EXCLUSIVE Rejig Your Gig Workshop! The premise of this workshop is that singers will be asked to prepare one of four pre selected popular songs and perform it with a live band. The band on the other hand will have rearranged these songs in various genres (ie.jazz, pop, rock, reggae etc) unbeknownst to the singer! Get ready to be pushed outside your comfort zone!! This LIVE PERFORMANCE workshop will be EPIC!Closing date to book your place is Wednesday the 31st of October! Mad About The Voice Ireland is delighted to launch our NEW Green Room Band Sessions! Taking place on Friday the 9th of November at 9.15pm, at The Porter House in Oranmore (in the upstairs function room), our Green Room Sessions offer a relaxed evening of live acoustic music, vocal talent and entertainment, free of charge! Featuring a selection of Galway's up and coming singers, our fabulous RISE Choir and accomplished pianist, composer and leader of one of Malta's most sought-after Wedding and Entertainment Bands Heathcliffe Balzan, as well as our trusty showcase musicians, this event aims to provide a platform for local talent and bring live music into the heart of the Oranmore community, providing a welcomed change to your typical Friday night! Hope to see you there! Your friendly support would be much appreciated! Have you ever dreamed about developing your vocal talents into a singing career? Well now you can!!! Teaming up with accomplished pianist, composer and leader of one of Malta's most sought-after Wedding and Entertainment Bands Heathcliffe Balzan, we are offering an incredible workshop on Repertoire, Performance and an Introduction To Corporate Singing on Friday the 9th of November at 7.30pm in the Porter House in Oranmore, dedicated to singers who are keen to learn the tools of the trade as a performing singer on stage and potentially establish themselves in Ireland's corporate music scene. As part of the workshop, each participant will be pre-allocated a song and will be invited to put their new skills into practice during a live performance from 9.30pm, in front of a relaxed and intimate audience of family and friends!If you are looking to improve your confidence and performance skills, connect a little more with your target audience, enjoy and explore repertoire you wouldn’t normally consider and delve into the in’s and out’s of life as a corporate singer, then this is the workshop for you! Places are limited for this event! The closing date to book your place is October 31st! This year our Summer Student Showcase will be pulling out all the stops! Taking place on Sunday the 1st of July at 6pm in the elegant G Suite of The G Hotel - a luxurious 5 Star Hotel located at the entrance of Galway City, our singers will be backed by a FULL LIVE HOUSE BAND and delivering a spectacular show aimed to inspire and enlighten you!! Featuring a selection of our incredibly talented Mad About The Voice Ireland and Spiritus Studios singers, this professional event provides an important platform for our singers' artistic growth and a memorable evening for family and friends to witness a milestone in their journey! With guest performers RISE Gospel Choir, raffle, prizes, surprises and more, this event is not to be missed!!!!! The entry fee for this event is just €10 (with children under 12 going FREE) and is aimed as a fundraiser to support our Industry Mentorship Programme! Ever wonder how Beyoncé and all the other greats do it? NOW is your chance to find out! 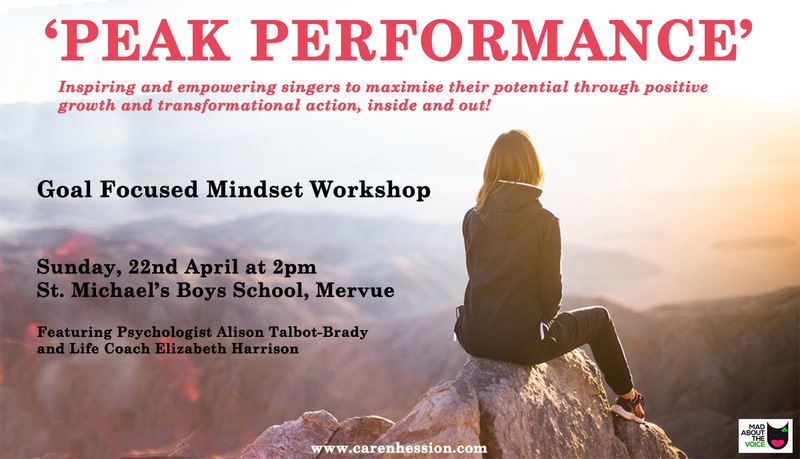 For the first time ever, Psychologist Alison Talbot-Brady and Life Coach Elizabeth Harrison have teamed up to present an uplifting and transformational workshop entitled ‘Peak Performance’ as part of Mad About The Voice Ireland’s Industry Mentorship Programme. Taking place on Sunday the 22nd of April at 2pm at St. Michael’s Boys School in Mervue, Galway, this workshop aims to motivate and inspire positive, goal orientated action through research led techniques and exercises, to maximise potential and achieve desired results. Whether your goals are personally or professionally driven, our coaches will give you the tools necessary for growth and transformational action, both inside and out! The cost of attending this workshop is just €25 and is open to all those who wish to learn more about instilling change in their life. Places for this event are limited and are offered on a first come, first serve basis. To book your place, please click the link below. For more information, please email info@carenhession.com! 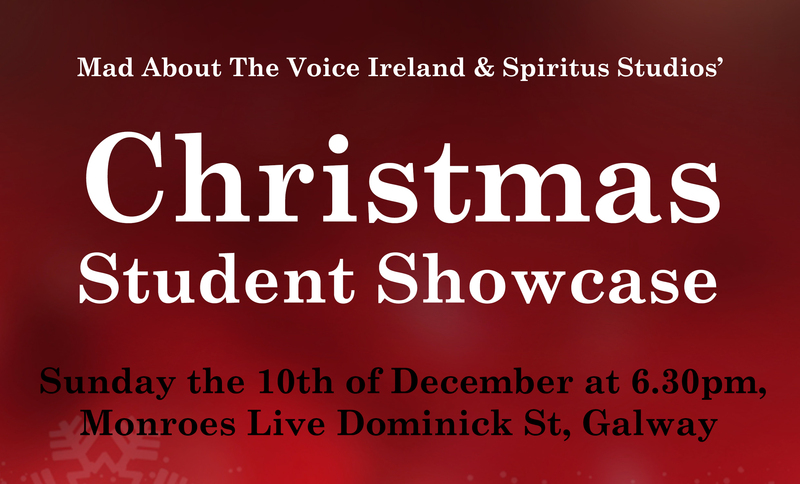 Our Christmas Student Showcase will be taking place on Sunday the 10th of December at 6.30pm (Sharp) on the Main Stage at Monroe's Live - an award-winning prestigious music venue in the heart of Galway's West End, where for the FIRST TIME EVER our singers will be backed by a FULL LIVE HOUSE BAND!! This professional event provides an important platform for their artistic growth and a memorable evening for family and friends to witness a milestone in their journey! 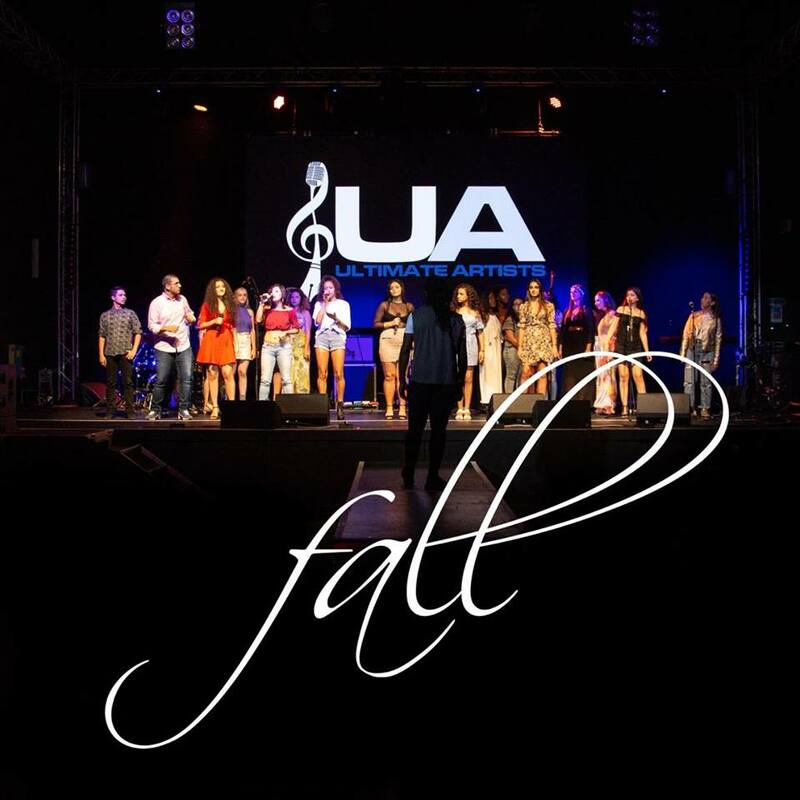 Taking place on Sunday the 15th of October from 12 to 4pm (venue to be confirmed), London's most sought after Industry Vocal Coach Joshua Alamu (currently vocal coach to JP Cooper, Little Mix, Emmi, Fleur East, Louisa Johnson, Moss Kena, Raye and many more) will be coaching singers on the more performative aspects of singing and self-expression with his HUGELY SUCCESSFUL and EXCLUSIVE Rejig Your Gig Workshop! The premise of this workshop is that singers will be asked to prepare one of two pre selected popular songs and perform it with a live band. The band on the other hand will have rearranged these songs in various genres (ie.jazz, pop, rock, reggae etc) unbeknownst to the singer! During the workshop, Joshua will be teaching singers the art of improvisation, 'feeling' your way through a song and learning to take control and command the band live on the stage - thereby helping you to create and deliver a unique, memorable and authentic vocal experience for you and your audience! The cost of attending this hands-on live performance workshop is just €45. Joshua has chosen two songs for this event 1) Crazy by Gnarles Barkley and 2) Greedy by Ariana Grande! ALL attendees are required to learn at least one of these songs by heart, but remember, the band has rearranged these songs into various genres for you! Get ready to be pushed outside your comfort zone!! This event is going to be EPIC!! Please note that places for this event will be limited and are offered on a first come, first serve basis. Places can be booked through our online booking system via the link below! The closing date to register for this workshop is Sunday the 8th of October. 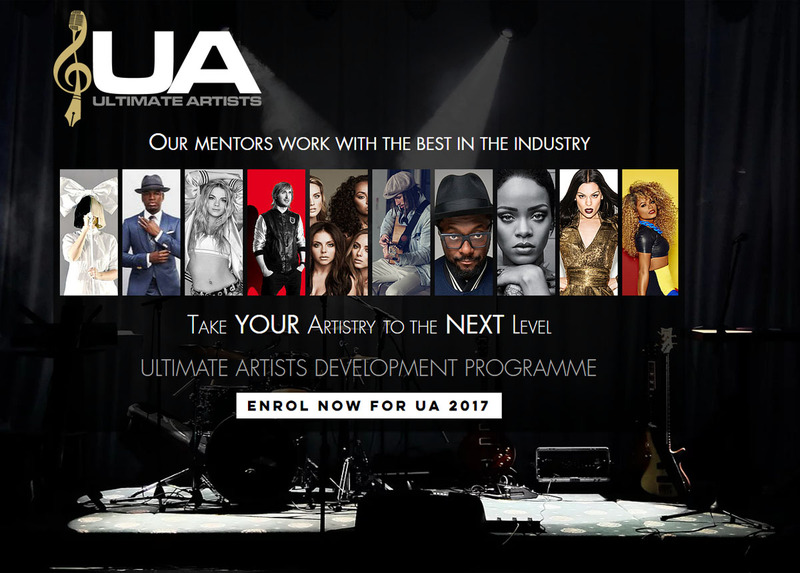 Ultimate Artists is an Artist Development Programme with a passion for nurturing talent, cultivating artistry and fostering self-belief. This ten day experience (running from the 11th to the 20th of August) will provide aspiring artists with an unrivaled platform to learn, network and develop a 360 degree skill set in the key disciplines of artist development, as required by today's ever-changing and competitive Music Industry. Working alongside some of leading mentors in the Industry, whose current clients include Rihanna, Sia, Little Mix, Louisa Johnson, JP Cooper, Dyo, Fleur East, Will.I.Am and David Guetta, Ultimate Artists will coach you in the areas of Singing, Song Writing, Production and Performance. 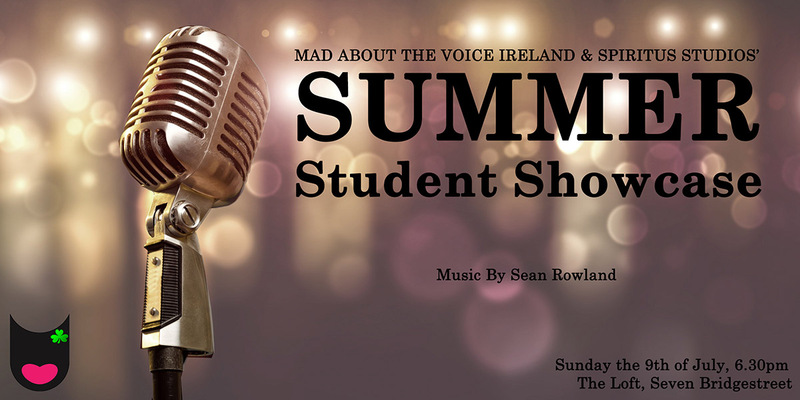 It's that time of year again.... our SUMMER STUDENT SHOWCASE featuring singers from Mad About The Voice Ireland and Spiritus Studios!! Taking place in The Loft at Seven Bridge Street, Galway City, on Sunday the 9th of July at 6.30pm, this event sets to celebrate the hard work and dedication of a selection of our incredibly talented MATVI and SS singers! With lots of raffles prizes up for grabs and as always, a truly memorable evening planned - our Summer Showcase is definitely one not to be missed!!! The entry fee for this event is just €5 (with children under 12 going FREE) and is aimed as a fundraiser to support our Industry Mentorship Events! Never before has the world of Musical Theatre and Popular Music been so intertwined with the art of Storytelling being integral across all genres. With this in mind, I am delighted to announce that Mad About The Voice Ireland's next Industry Mentorship Event is with none other than West End duo Richard Halton (former Phantom of the Opera) and Julie Gossage. 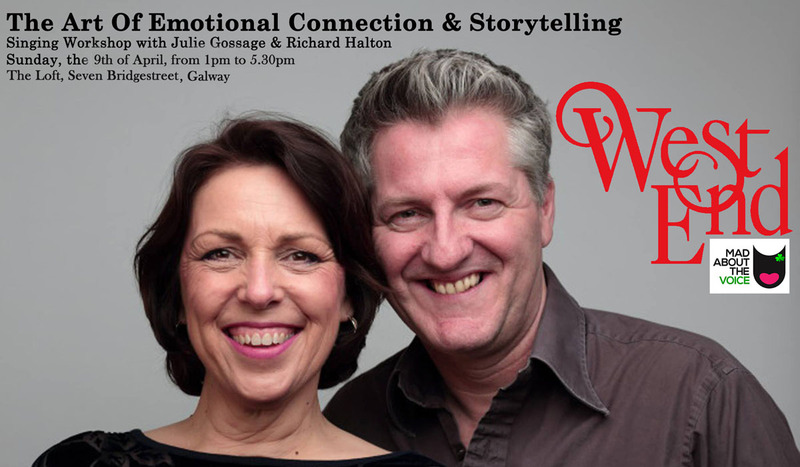 Taking place on Sunday the 9th of April from 1pm to 5.30pm at The Loft in Seven Bridgestreet (Galway City), our Musical Theatre King and Queen will be conducting a unique and invigorating workshop on 'The Art of Emotional Connection and Storytelling'. With a combined 40yrs of international teaching experience, in addition to performing over 40 principal roles with all the major British Opera companies, Julie and Richard will coach singers on the performative aspects of singing, 'connecting to the text' and delivering the emotion of a song with precision and authenticity, regardless of whether you are a musical theatre fanatic or more of a popular singer. The cost of attending this event is €25 per person and must be paid in advance. 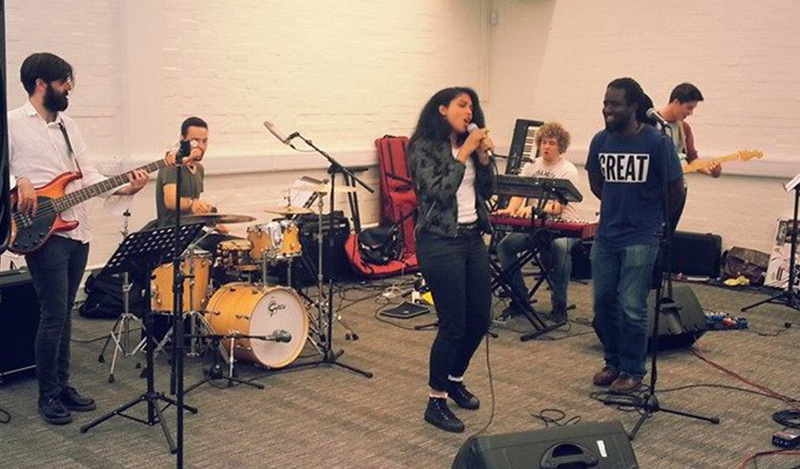 Singers also have the opportunity to participate in 'Your Twenty Minutes' where they can work directly with the coaches on a song of their choice during the workshop. The cost of participating in this option is €35 per person, however places are limited therefore early registration is advised. Tickets may be purchased through our online booking system outlined below or directly at the studio. 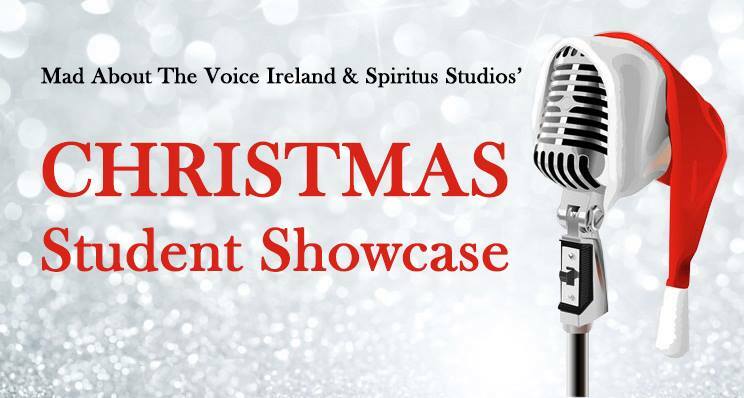 We are truly delighted to announce our second Mad About The Voice Ireland and Spiritus Studios Showcase!! Taking place in The Loft at Seven Bridge Street, Galway City, on Sunday the 11th of December at 6pm, this event sets to celebrate the hard work and dedication of a selection of our incredibly talented MATVI and SS singers! With lots of raffles prizes up for grabs and a VERY SPECIAL SURPRISE in store - our Christmas Showcase is definitely one not to be missed!!! 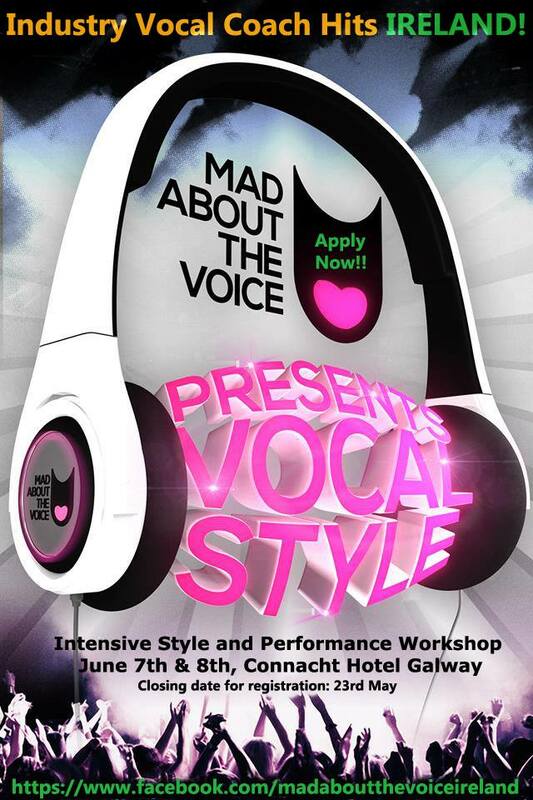 It is with great pleasure that we announce yet another Mad About The Voice Ireland Industry Mentorship Event! 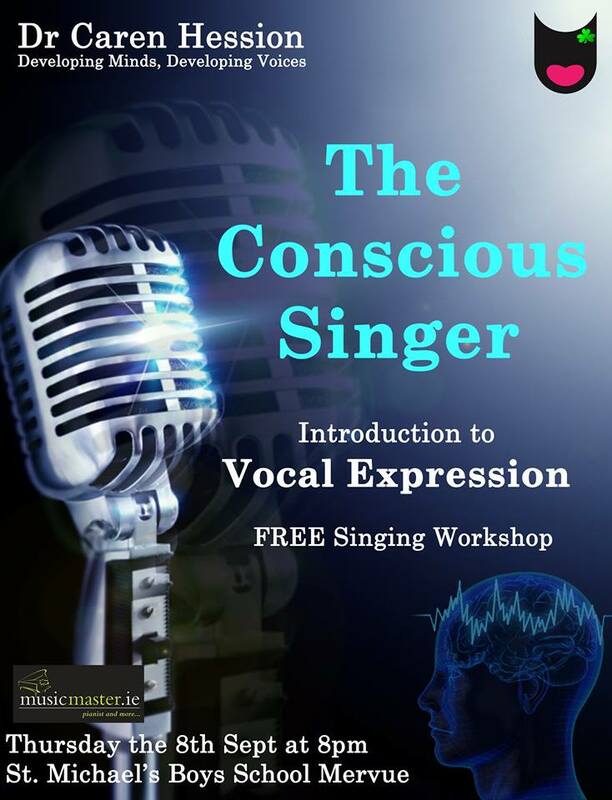 Taking place on Monday the 7th of November from 7pm to 9.30pm at The Loft in Seven Bridgestreet (Galway City), International Vocal Performer Randolph Matthews will be conducting a very unique and invigorating workshop on Stage Performance, Charisma and Creative Voice. As an outstanding performer, vocal explorer, composer and story teller, Randolph has earned a world class reputation for his distinct craft, soulful sound and transferable energy. As such, this intensive workshop will focus on the art of creative communication, vocal charisma, artistic freedom, stage presence and audience engagement. Following the workshop, Randolph will be heading to the Cellar Bar on Eglinton St, where he will join the PLAY house band at 10pm to open their Monday night sessions. 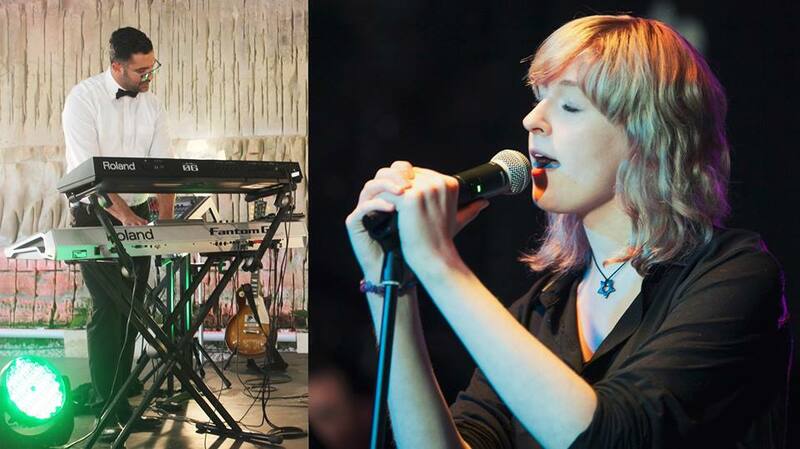 As one of the only full live backing band open mic's in Galway City, workshop attendees will also be welcome to perform, along with PLAY's regular house singers*. The cost of attending this event is €25 per person and must be paid in advance. Tickets may be purchased through our online booking system outlined below or directly at the studio. 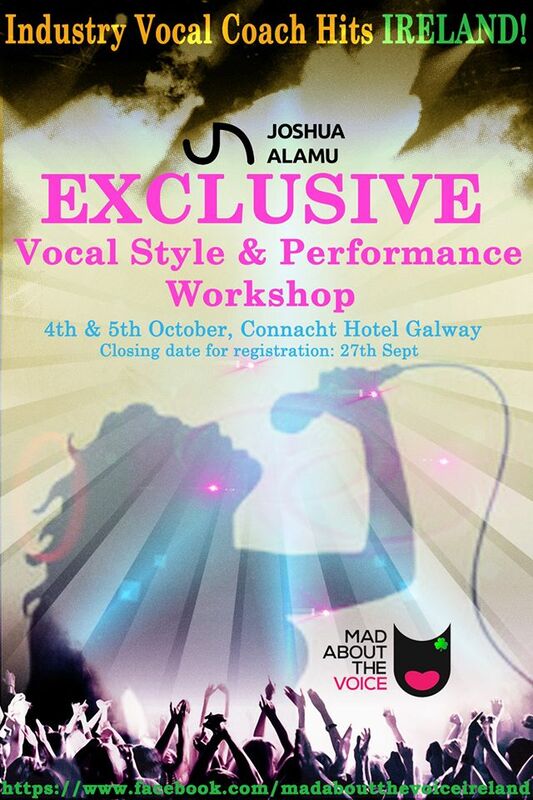 We are truly delighted to announce our FIRST EVER Mad About The Voice Ireland and Spiritus Studios Showcase!! 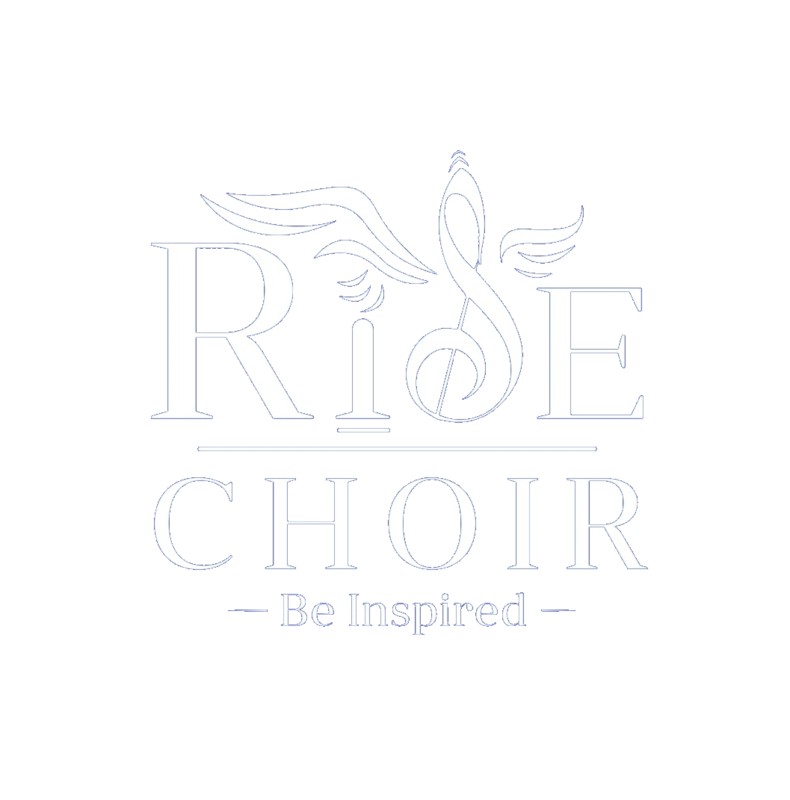 Taking place in The Loft at Seven Bridge Street, Galway City, on Wednesday the 6th of July at 7pm, this event sets to celebrate the hard work and dedication of a selection of our incredibly talented MATVI and SS singers! Opening by Industry Vocal Coach Joshua Alamu (whose current clients include Fleur East, Little Mix, J.P. Cooper and The Voice), we have no doubt this will be a memorable evening so please come down and support us! 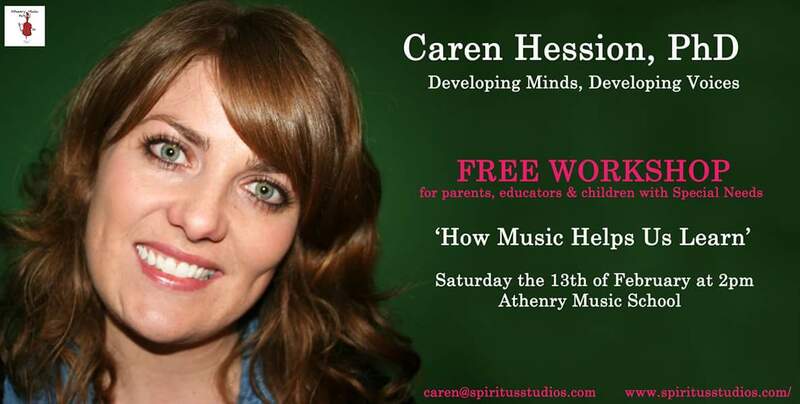 Galway Researcher Dr Caren Hession, who recently completed a PhD investigating the effects of an Audio Visual Approach to Equine Therapy on the social, emotional and cognitive development of children with special needs, is conducting a FREE workshop on 'How Music Helps Us Learn' at the Athenry Music School on Saturday the 13th of February at 2pm. The workshop, which is open to all members of the public � in particular parents, children, music enthusiasts and educators - will explore the role of Music and Singing on the Child Development.